Home » Russian literature » Na borbu s khuliganstvom v literature. Flegon reprint of Klutsis design. Na borbu s khuliganstvom v literature. 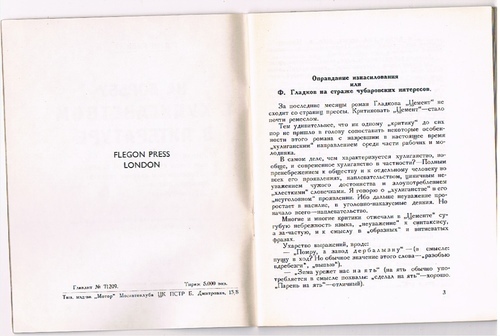 Flegon reprint of Klutsis design. izdanie avtora. Probably late 1960s early 1970s. Card covers printed in black, 32pp.. Covers a little faded, small closed tear to upper cover, owner name inside. Else clean and tight. ; Undated facsimile edition by the notorious Flegon Press. Kruchenykh was perhaps the most radical poet of Russian Futurism, a movement that included Vladimir Mayakovsky, David Burliuk and others. Together with Velimir Khlebnikov, Kruchenykh is considered the inventor of "zaum". 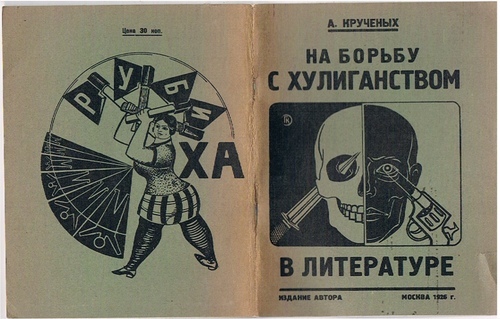 The cover was designed by Gustav Klutsis, constructivist avant-garde photographer and illustrator.